The Escape is a fairway driver designed to keep you in the fairway by keeping a true and consistent flight path from beginning to end of flight. 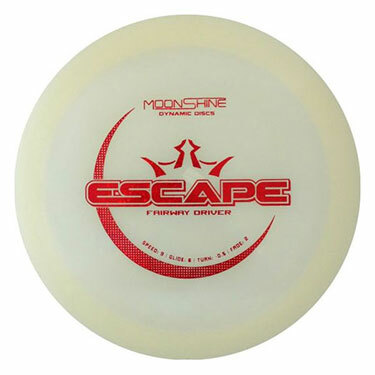 Predictable flight characteristics power the Escape past all other fairway drivers, perfect for all skill levels. Lucid Moonshine Glow Moonshine has all of the benefits of Lucid with an added feature - it glows in the dark! Give your disc some light and keep golfing all night long. Expect Moonshine molds to be slightly more overstable than the Lucid version.